Pfaudler, an American company founded in 1884 in Rochester, NY, is now owned by a German private equity investment firm. Pfaudler introduced its steel, glass-lined storage tanks at the end of the 1800s. Pfaudler is still very active, you see here a snapshot provided by Bloomberg. It provides process solutions (equipment, services) in many areas for the chemical and pharma industries. It still designs and supplies the glass-lined tanks which made its initial fame. By 1906, Anheuser-Busch invested in them big time, and did away with pitched wood tanks. In that year, A-B ran a series of ads in different regions advertising the new technology. A group of them is here, the short news account (advertorial) is illuminating. These ads claimed 4-5 months aging in this period, and the beer touched no wood from brew kettles to bottling, from “kettle to lip” it was processed in glass, notably the fermentation and aging stages. Changes such as this hastened the demise of the pitch taste in beer. Still, some of it remained in draft beer as wood barrels were still used to send beer to bars. In this regard, an interesting dichotomy must have opened between bottled and draft beer. Budweiser was initially a bottled beer. It was later supplied on draft as well. When storage vessels were pitch-lined, some of the flavour must have entered all forms of the beer. Hence the claim in 1899 of a “mild pitchy bouquet” for (clearly) the bottled beer I discussed yesterday. But beer bottled from the new glass tanks would not have featured the taste. It makes sense to me that from about 1906, an attempt would have been made to keep the pitch flavour in trade casks to a minimum. This would keep the flavour of the draft and bottled beer closer. (Another difference was that draft beer then in America was unpasteurized; today draft Budweiser from AB-InBev in Canada anyway is flash-pasteurized). This march of technology perhaps explains the numerous references in mid-20th century literature on pitch having no or very little taste. What was viewed in Pilsen – where golden lager originated – as a contributor to the palate c. 1900 was not wanted later when the bottled beer showed no pitch aroma. 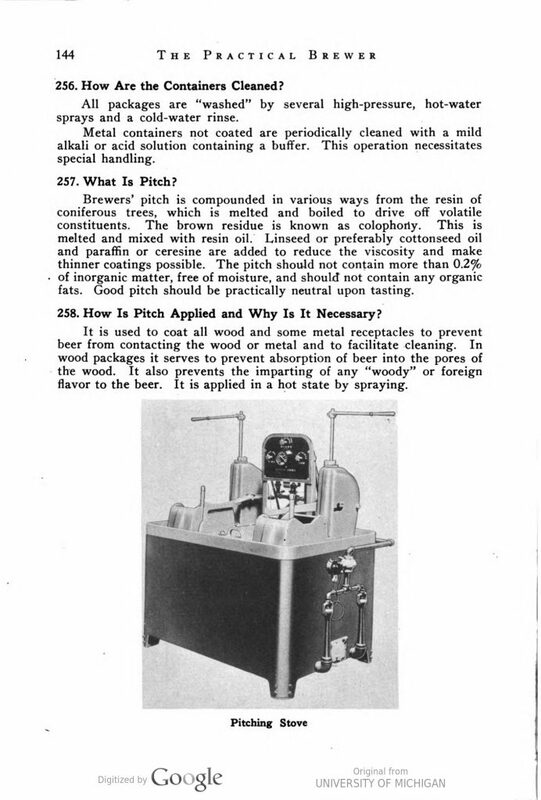 Edward Vogel’s brewing manual of 1946, as did earlier brewing texts of the 1900s, stressed that pitch should be neutral on beer. English brewing scientist Lloyd Hind, writing some years earlier, stated the same thing for pitch and various enamels such as Mammut, I cited the reference in a comment to yesterday’s post. Some lager producers may still have used a pitch for trade casks which produced a definable odour. This was surely part of the pre-consolidation era variety in North American brewing. But once metal barrels came in use by all brewers (latest 1950s), even this residual distinction in process would have disappeared. The extract below is from Vogel’s book mentioned above.